In a Sifton neighbourhood. Experience The Difference of City Savvy, Country Comforts. Pricing and lot availability subject to change without notice E. & O. E.
2251632 Ontario Inc. c.o.b. Lifestyle Magazine R.R.#1, Eden, ON N0J 1H0 P: (519) 866-5949 Copies are distributed to selected homes in London and area and in local businesses. Canada Post Agreement #41277015 No part of this magazine may be reproduced without the written consent of the publisher. The publisher accepts no responsibility for unsolicited material. All rights reserved. Printed in Canada. New home build based on the design of homeowners, Susan Jarmain & Doug Singbush of Port Bruce, Ontario. Offering complete design & budget consultation for the custom home of your dreams. No detail will be overlooked in our attempt to give you the best quality work at the most economical pricing. Specializing in blending your new project into an existing structure to ensure your addition & renovation will harmonize with the style of your home. We have vast experience working on century homes â&#x20AC;&#x201C; carefully balancing history with function. Member in good standing of the Tarion Home Warranty Program since 1997. As life becomes busier and time is increasingly valuable, more people are trying to simplify their lives. Many of us dream of buying a cottage getaway near a lake, but the work involved in maintaining two homes separated by long distances prevents many people from following through. A trend that began a few years ago of combining a home and a cottage seems to be gathering momentum. Whether you live near a lake, in the country or in the suburbs, it's possible to create the sense of a getaway through creative landscaping and home design. 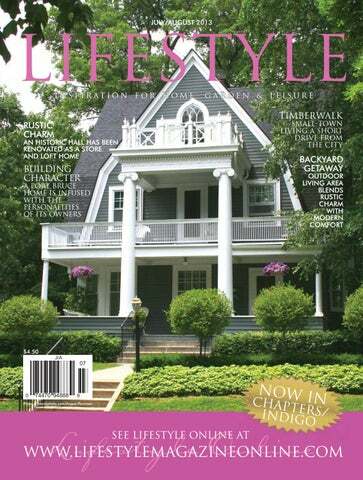 In this issue of Lifestyle, we've featured several properties that combine the getaway-athome concept. Writer Ellen Ashton-Haiste has profiled a home in Port Bruce that was designed by the owners Doug Singbush and Susan Jarmain. Modern in design, the home encompasses views of Lake Erie and features natural finishes, such as a bathroom floor made of beach glass. Many of the colours used in the home mirror the hues of the lake and sky, creating a symbiotic relationship between the indoors and outdoors. In Ilderton, Jen LeClair and Bob Vanhouwelingen decided to bring the cottage to their backyard. Old and new were mixed in an outdoor living area that encompasses a kitchen, a swimming pool and a covered patio with a wood-burning fireplace. What sets the retreat apart is the homeowners' desire to integrate rustic elements such as reclaimed wood timbers into the design. Other interesting renovations in this issue include a year-long makeover to a home near Aylmer. Custom murals, archways that connect rooms and colours evocative of autumn have added to the owners' enjoyment of the home. And in downtown Hensall, an unusual loft apartment was created from an historic hall. The owners – enthusiastic collectors – could see the potential and proceeded to work cast-off architectural elements into the design, creating a home that is at once individual and universally appealing. While spending time at home is always a relaxing option, you'll probably want to take in some summer festivals. We've included two – Aquafest in the Grand Bend area and Harbourfest in Port Stanley, which will feature three days of tall ships and musical entertainment. AN HISTORIC HALL HAS BEEN RENOVATED AS A STORE AND LOFT HOME By Ellen Ashton-Haiste “Primitive” is the adjective Paul Le Clair uses to describe his Hensall, Ont. loft. But country charm with a rustic ambiance may be a more appropriate description for the home he and Gillian Mitchell have created above their Pine Sampler reproduction furniture store. The historic Odd Fellows Hall, on the main street of the Huron County village, didn't look like much when they first saw it, Le Clair admits, displaying “before” photographs of nondescript rooms and hallways. But the couple – both enthusiastic decorators and creators – saw potential. Left Top: The loft's living room is anchored by a gas fireplace, flanked by original windows overlooking the street. Left Centre: Timber post-and-beam dividers visually separate the kitchen area from the living room. This photo: A blanket box rescued from a Toronto ravine serves as a living-room coffee table. A television is tucked away in a wooden corner cupboard. As they began to peel away layers of drywall and plaster, the building's true heritage character emerged. On one side they discovered an original brick wall that now blends flawlessly with their eclectic inventory that includes Le Clair's reproduction furnishings and Mitchell's handmade teddy bears, and hooked rugs and pillows. Their passion for antiques and rustic charm influenced the living area they created above the store. An original open space became the living room and kitchen while a two-storey rear addition they built accommodates a bathroom and a bedroom, and forms a ground-floor workshop for Le Clair. When they stripped away the second-floor walls, Le Clair says they expected to find brick, similar to the ground floor, but instead discovered lath. They liked the texture and decided to leave it exposed. As well, he says, “there's tongue-and-groove ceilings and floors throughout the original space.” Reluctant to break up the open-plan design with walls, the couple used timber-frame post-and-beam dividers – constructed by Mitchell's son, Alex Oke, owner of Okewood Timberworks in Brussels – to delineate the areas. In the living room, a gas fireplace is flanked by original windows overlooking the street. A comfy couch and chairs with plentiful cushions provide a restful place for relaxing. The space is peppered with antiques and salvaged items – an old blanket box, rescued from a Toronto ravine, now the coffee table; an old-fashioned post office mail sorter filled with wooden block letters, and a vintage apple orchard ladder leaning in a corner. Below: The bedroom has a second gas fireplace and a reading nook tucked behind an armoire. Bottom: Paul Le Clair built a stone feature wall in the bedroom and a headboard fashioned from an old architectural peak. Above: A claw-foot tub in the bathroom fits perfectly with the rustic ambiance. The kitchen's centre island was built from doors that came from an old house, topped with a pine counter and a deep stainless steel sink. Two salvaged antique doors – complete with original paint and screens – as a front for a I’mprovided thinkinginspiration if you could cupboard. The pantry is flanked by justpantry leave everything the a refrigerator – which looks as if it could same and replace all have come from the '50s but is actually info about Classic and new from Elmira Stoveworks – and an replace with the white 80-year-old electric stove that Le Clair logo and info I will attach says still “works like a charm and Gillian thedoesn't Company webpage want to part with.” for Reference.The old ad The bathroom, with its freestanding hasclaw-foot the Company phone tub, connects the kitchen to the andbedroom. fax #. That won’t be Le Clair “It's new, acrylic,” nessesary Justgoing the toformal says. “I wasn't carry a cast-iron name and info. I tub up those stairs!”look forward to Mitchell a proof-thanks There, and Le Clair have as created alwaysa cosy retreat that carries on the -- rustic ambiance with a second gas fireplace and reading nook. The bed is set against a stone wall, which Le Clair built by adhering flat-backed stones to a plywood base; it's something he's particularly proud of. He also built the sliding barn door that separates the bedroom from the bathroom. Below: Next to the basin, a towel holder is made from a clothes hanger. For everything under foot and then some. Above: The ground floor of the building houses The Pine Sampler where Le Clair and Mitchell market their creations. a cs and eccable ter a ashions. Effective May 1 until August 31, 2013. † Minimum of two Silhouette® or Pirouette® with PowerRise® units. The bed's headboard is fashioned from an old architectural peak with veranda columns cut down for the footboard. French doors lead to a diminutive balcony, with a couple of bistro chairs, overlooking the couple's newest addition, a backyard garden oasis. Previously a shuffleboard court, the backyard is now enclosed with wood fencing and landscaped with gardens full of flowers and shrubbery, and a pebble walkway lined with stacked stones. Oke Timberworks built a pergola, which echoes the interior post-and-beam construction, where wicker patio furniture provides a perfect place to enjoy the outdoors. Le Clair and Mitchell have put the retreat they've created on the market. Le Clair says, at this stage of life, he's “ready to retire and just build my furniture in my garage and shop it around to area retailers.” The space, he says, will attract “a unique buyer who appreciates this atmosphere. It would be ideal for an artist, who could use the lower level as a studio/gallery to display their work. And,” he adds, “for someone who likes the look, it's ready to move in.” Below: The couple's backyard retreat features landscaped gardens, a pebble walkway and a relaxing seating area in the pergola. Town and country living in one package Home buyers who long for rural ambiance but also appreciate the convenience of urban amenities can have it all in one package at Deer Run Estates off Hwy. 21 south of Grand Bend. The homes in this South Winds Development are set on half-acre lots, nestled among mature oak and pine trees for ultimate privacy. Surrounded by rural farmland and located directly across the highway from the forest trails and pristine Lake Huron beaches of Pinery Provincial Park, the community is a true woodland retreat. Yet, it’s just six kilometres from the village of Grand Bend with its shopping, restaurants, theatre, nightlife and popular wide sand beach. As well, there are more than 10 golf courses within a 10-minute drive. Buyers may bring their own builder or choose from one of Deer Run’s exclusive house plans. The opportunity to build a dream home or cottage in one of Ontario’s premier resort communities at an affordable price – lots start at just $69,900 plus HST – won’t be available forever. There are only 10 lots left in the final building phase. The model home and presentation centre is open for viewing on weekends, 12 - 5 pm or by appointment. For more information about Deer Run and exclusive finance options, visit www.deerrunlifestyle.com. By Heather Toskan Summer beckons with the promise of sunny rays, warm days and time for fun and relaxation. Planning a wardrobe around clothes that are stylish and comfortable can be one of summer's many pleasures, whether one's plans include special social occasions, relaxing close to home, or travelling. “Clothes made of materials such as polyester, rayon, cotton and linen are comfortable. They're great for travelling and can be easily dressed up or down to suit casual and dressy occasions,” says Marian Bentley of Sara Sohan in London's Cherryhill Village Mall. According to Bentley, no matter what your plans or destination, fashionable “must-haves” include body-skimming dresses, tunics with co-ordinating leggings, Capri leggings and pants that go the distance. This photo: Shown is a dress set in pink, white and coral from the Dolcezza summer 2013 collection. Page 5: White pants, lime dress and lime loose-knit sweater are from the summer 2013 Kokomarina by Antoine Coelenbier collection. All fashions shown are available at Sara Sohan in London. Fashions shown may not be available by the time Lifestyle is published. Please call the retailer to inquire about availability. Above: Burst into summer with a graphic print dress popping with colour. This sleeveless dress features an angle-pleat torso and cowel neckline. This dress is from the Dolcezza summer 2013 collection. Texture, pattern, colour and print all play a role in creating stand-out summer silhouettes, which include dresses and tops with scoop necklines, cap sleeves and variations on high-low and asymmetric hemlines. Vibrant tops in shades such as lime, coral, turquoise and orange look fresh and pair well with free-flowing white pants and other bottoms. For those who prefer to wear neutral hues, shades of pale sand, grey and off-white offer stylish options. Patterns are popular and range in style from sporty to polished. “A brightly coloured stretch-knit abstract print dress looks sleek and polished for dressy occasions with the addition of some colourful jewellery, a dressy bag and shoes,” says Bentley. Above: White pants, coral sleeveless dress and coral crop jacket are from the summer 2013 Kokomarina by Antoine Coelenbier collection. Stripes offer a sportier look and, if you wish, you can simply follow the lead of many fashion designers by choosing to mix and match stripes and patterns. “There's no need to be too matchymatchy,” notes Bentley. Tops and dresses are often fashioned from textured, crinkly materials and feature further textural interest by way of origami-inspired knots and folds, and tie and wrap styling. Collect Air Miles rewards while building your dream deck and fence! Jarmain and Singbush were no strangers to creating a home. Several years ago, they restored a nearby 1850s Greek revival home, still in its original condition with no plumbing or electricity. They kept it authentic, retaining original materials or sourcing period items from a local salvage dealer. Their new project was at the opposite end of the spectrum – building a new, modern home. While Jarmain is adamant that “a restoration must be authentic and a new home must be modern in design,” the couple did import some heritage elements. They used pine boards from their restoration to build the kitchen cabinets and sourced solid wood 1850svintage doors. A closet is enclosed by reclaimed wood shutters, stripped of layers of paint but with nail holes from previous use still evident. “It's part of their history,” Jarmain says. Above: Natural light is conveyed into the master bedroom from a ceiling solar panel and large windows that overlook the Lake Erie shoreline. Far Left: The second-floor bathroom has an open shower with sidelight windows containing coloured glass to mirror the hues of the lake and sky. Left: Jarmain used beach glass to create decorative patterns in the backsplash of the upstairs bathroom, which features a travertine marble counter and basin. The home's modern features are eq-CatandHouse_12th_JA13.indd ually striking, beginning with its shape which resembles a series of building blocks set together and topped with a flat roof. The second-floor block rises SINCE 1990 from the centre front section. Jarmain says she likes “the simplicity and the boxy style.” The house, with no basement, is set on a concrete slab. The exterior walls are concrete, clad in stucco. The main floor's polished concrete floor features radiant heating. Above: In front of the home, the couple has planted several gardens of flowers, trees and shrubbery. The design and construction make the home “dreamily comfortable,” Jarmain says. When the 80-kilometre-an-hour winter winds sweep across the lake, the couple watches the outside fury in cosy comfort. “We don't hear the storms. It's amazing. Winter is way less of a threat,” Jarmain says. Inside, the front foyer opens to an office and a barbecue patio that links the main living area to Jarmain's studio along the western end of the home. The studio features a bank of north-facing windows, which she says is the best light to work with. The windows overlook the front lawn, with a pond and several gardens where the couple has planted trees and shrubbery. Tight space? Poorly built addition? Come see how Covenant overcame it all. This one bedroom old south home had just a small opening to the 128 sq. ft. kitchen “addition”. Craig Hardy along with Erika Friesen, expertly designed the space to maximize function, storage and light. After rebuilding much of the structure, adding vaulted ceilings and a skylight, we opened the wall to the diningroom with a properly engineered structural beam and the space was ready for the custom cabinets. The burled walnut island was shaped to provide access to the side entrance and basement. Additional storage was created above the sink range hood and again with an appliance garage, and a storage system by the back stairs. With a nod to the traditional elements of Old South, this modern kitchen is ready to function in todays busy world. Contact our professional team to assist in transforming your home! Above: Although they love wood fires, the couple opted for a cleaner and more convenient gas fireplace in the living room. A hallway off the kitchen/living room leads to the bathroom and a study/TV room that doubles as a guest bedroom. The study and the living room open to a patio with a stacked stone wall and waterfall. Jarmain employed her artistic talent, using beach glass to create the floor in the main bathroom and to apply decorative patterns to the backsplash and shower in the upstairs bathroom. She also installed coloured glass panels in shades of blues, pinks and mauves in two sidelight windows flanking the shower upstairs to mirror the hues of the lake and sky. The second floor also includes the master bedroom and laundry facilities, tucked into a closet. YOUR LOCAL HARDWOOD FLOORING EXPERT! MUSEUM LONDON Museum London is Southwestern Ontario's leading establishment for the collection and presentation of visual art and material culture. Through public and educational programming, special events and exhibitions, Museum London strives to promote the knowledge and enjoyment of regional art, culture and history. At the heart of a great museum is its collection and Museum London is proud to have one of Canada's most important art collections, and one of the most significant historical artifact collections in Ontario. Their art collection has more than 5,000 regional and Canadian works and their 25,000 artifacts reflect the history of the City of London as an important regional urban centre in Southwestern Ontario. Museum London was established in 1940, operating from the London Public Library until 1980 when architect Raymond Moriyama was commissioned to design its current home at the forks of the Thames River in downtown London. INNUIT GALLERY Discover the finest Inuit and North American Aboriginal art. Celebrating 27 years of excellence, they specialize in carvings in stone, whalebone and antler, as well as Inuit prints, jewellery, and paintings. On September 9, 1901 the New Grand Opera House welcomed its first patrons. Men in elegant evening attire and women in rich gowns took their seats for the opening night performance of the popular melodrama Way Down East. As they applauded that night, the audience did not know they were establishing a century-long tradition. One hundred and twelve years later, The Grand Theatre is still a cultural icon in London and is recognized nationally as a cultural leader. The theatre is an excellent example of the proscenium arch theatre and is one of the more traditional forms of theatrical design; it was designed to send music and sound from the stage into the audience. The Grand is committed to producing some of the best professional live theatre in Canada and to enriching, engaging, entertaining and transforming the lives of the members of its community. With its MainStage, UnderGrand and Theatre for Young Audiences performances, the theatre takes great pride in providing world-class entertainment to London and Southwestern Ontario residents each season from September to May. It was Toronto entrepreneur Ambrose Small who built the theatre and operated it until his mysterious disappearance on December 2, 1919. That day, Mr. Small deposited one million dollars in a Toronto bank account, lunched with his wife and was never seen again. Weeks after his disappearance, the night watchman swore he saw Mr. Small entering The Grand Theatre. Despite this lead, police were never able to close the file. Many believe that Mr. Small's ghost still keeps a benevolent eye on his beloved theatre. Among the great actors who have performed under the magnificent proscenium arch of The Grand are: W.C. Fields, Sarah Bernhardt, Michael Redgrave, Donald O'Connor, Sidney Poitier, Jessica Tandy, Hume Cronyn, Maggie Smith, Michael Burgess, William Hutt, Martha Henry, Karen Kain, Victor Garber, Sandra Oh and Leonard Nimoy. LONDON’S TREE TRUNK TOUR The Tree Trunk Tour demonstrates London’s love of trees and enhances its reputation as the “Forest City.” Two carvers, Robbin Wenzoski and Neil Cox, have created sculptures that, instead of being confined to an art gallery, are on public streets. From tree stump to concept drawing and the final carving, it takes about four weeks to transform the tree into a sculpture. About 95 per cent of the carving is done with chainsaws ranging in size from large blocking saws to delicate carving saws. Detailed finishing work is accomplished with chisels and power rotary tools. The sculptures are usually painted or stained and are then coated with automotive polyurethane enamel to preserve the wood against the weather. With our unique lighting and fireplace designs, your home will become a showpiece. Our Unique Perspective to Quality Print Solutions We truly understand where you’re coming from. You see, we’ve been there. For years, we were the client, working to find the best printing company for our product... the 142-year-old Canadian Sportsman magazine. With our unique perspective, we are able to anticipate unexpected challenges on both sides of the desk... so you don’t have to. Sportswood Printing has built its success on a foundation of quality and service at an affordable price. We have earned our reputation by regularly updating our equipment and facilities. With state-of-the-art printing presses we are continually able to meet the growing needs of our customers. We have the confidence and the capabilities to meet your print demands and we will endeavor to make your first impression a pleasant and lasting one. At Sportswood, we maintain a clear focus on our mission: to set the bar high and strive to surpass it. Put our unique perspective to quality print solutions to the test. By Ellen Ashton-Haiste Every Tuesday evening, May to October, a band of bikers heads out on the highways and byways around Tillsonburg. If you're envisioning leather vests, bandanas and tattoos, you're way off base. Think, rather, mature women, wives and moms. Six women, riding together for eight years, have discovered companionship and friendship along with the joy of the open road. Left to right: Linda White, Lory Woolgar, Viola Neale, Deb Beard, Janet Reiser and Wilma Van Vaerenbergh. “It's rare and special to have a group of ladies who have stayed together this long,” says co-founder Wilma Van Vaerenbergh. She was bitten by the bike bug when, following the death of her first husband in 2002, she was looking for activities that weren't “couples” related. A friend was planning to take a motorcycle course so Van Vaerenbergh tagged along. “We bought our first brand new Harleys before we even knew if we passed,” she says. A couple of years later, she and another friend and fellow rider, Janet Reiser, were “chatting at the gym about how nice it would be to have a group of ladies ride together once a week,” and the tradition was born. Word spread and at its height the group numbered a dozen riders. It's since dwindled to six and Van Vaerenbergh says all agree it's just the right number. tage It with Jennings Design Resource Boutique has opened some supply channels that were previously closed to small independent decorators and designers. Stage It is affiliated with Jennings Furniture & Design which, as a stocking dealer, has access to hundreds of vendors for everything needed to furnish a high-end home, from furniture and bedding to cabinets and countertops. The store’s long-term relationships and high-volume buying history give them a purchasing advantage and owner Renée Carpenter is passing along that advantage to qualifying decorators and designers, who can order merchandise at discounted trade prices from an extensive list of designer and upscale manufacturers. “When you resource through Stage It, you have the backing and support of a longtime furniture retailer who will take care of all back-end functions,” says Carpenter. “We offer hassle- and headache-free delivery to our warehouse, where we will unpack and set up furnishings. We’ll return damaged goods if necessary, and can deliver and set up accepted items in your client’s home.” The Design Resource Boutique is open by appointment to trade professionals only. Private work space is available for client and designer to meet and, once selections have been made, Stage It will provide a quote within 24 business hours. ou don’t get a second chance to make a first impression. That holds true for job interviews, meeting the future in-laws, or showing a home to potential buyers or renters. When you are showing a property, you want the first impression to be, “Wow! I’d be happy living here!” Home owners, realtors, developers and stagers can now up the “wow” factor by renting quality furniture from Stage It with Jennings Luxury Furniture Rental. “Stage It offers a continual supply of designer furniture for vacant homes that require a decorative touch,” says Renée Carpenter, owner of Jennings Furniture & Design, which supplies the stock for Stage It. “The option to rent new, trendy, high-end furniture for vacant and show homes is a new concept and we’ve been overwhelmed with the response.” If a home is not vacant, customers can choose to have it accessorized only. There is also an option to have the home professionally staged by Carpenter and her staff. Stage It can accommodate a range of needs, from small to large pieces, from one room to a whole house. There is an initial four-week minimum rental period, which can be extended in two-week increments. European river cruising has become the fastest-growing travel segment among the baby boomer and zoomer audiences. They have a passion for travel but, as they get older, they don't want to work too hard at their travel experiences. As they search out their ideal destination, they look for special experiences away from crowds of fellow tourists, along with authenticity, luxury, comfort, cuisine and culture. When the spectacular continent of Europe is being considered in one's travel plans, all of these features are easy to come by – but not without a significant cost. This is where an all-inclusive river cruise journey with Scenic Tours and Cruises fits the bill. Scenic “Space-Ships” boast cuttingedge new features including the Scenic “Sun Lounge” which, at the press of a button, allows you to convert your private balcony to an indoor lounge. Our ships also feature multiple dining venues including the River Café for all-day dining, Table La Rive – a six-course tastings menu with wine pairing – and our main Crystal dining room. These elements make cruising the picturesque rivers of Europe a truly relaxing and enjoyable experience unlike any other. Scenic Tours offers a wide range of cruising itineraries encompassing the Rhine, Danube, Main and Moselle rivers of Europe, as well as the Rhone and Seine rivers in France and the Volga in Russia. In every respect, Scenic Tours – The Ultimate River Cruising Experience – is renowned for delivering unrivalled allinclusive luxury. All of our cruises include all on-board meals and beverages, on-board entertainment, all onshore excursions and activities, personalized airport transfers, and all tipping and gratuities – so there is nothing more to pay except for personal expenses. One of our passengers commented: “If an ocean cruise is like a convention, a river cruise is like a large dinner party. The greatest luxury, of course, was the balcony. There, in teak chairs, we drank coffee in the morning and wine after dinner in twilight, watching life along the shore. We had one of the best vacations of our boomer lives.” Discover even more about European river cruising from some of the most knowledgeable travel consultants in the London area at Cruise Holidays London, 1422 Fanshawe Park Rd. W. or visit www.london.cruiseholidays.com. Railway City Brewing Company A new location gives the St. Thomas brewer room to grow Railway City Brewing Company in St. Thomas is five years old now and, to celebrate, owners Paul Corriveau and Al Goulding are moving into a space that is five times larger. The new 13,000-square-foot location on Edward Street will give the company expanded production facilities, more retail space, and a tasting room that will be large enough to host special events. Future plans include converting the tasting room to a tap room, and holding outdoor events, such as concerts, in the large parking lot. Railway City Brewing Company is open seven days a week and offers daily tours of the brewing, canning and bottling, and labelling operations, culminating with samples in the tasting room. While no one will be turned away, it’s best to call ahead at 519-631-1881 or e-mail info@railwaycitybrewing.com. YMCA Youth Centre in Grand Bend; the annual water-themed photo contest, as well as the Student Art Contest and Show featuring entries from schoolchildren in the Lambton region. The popular Great Lakes Chowder Competition will be back, with restaurateurs showcasing their culinary skills as they vie for the Chef's and People's Choice Golden Spoon awards. Water is an essential resource and we are responsible for its stewardship, says Jennifer Mossop, one of the event organizers. With supplies dwindling around the world, lake levels at a record low and a growing global population, she says, â&#x20AC;&#x153;it is imperative we all do our small part to protect and preserve it. Every drop in the bucket counts.â&#x20AC;? Since Aquafest is a celebration of water, it will go ahead rain or shine. Last y e a r, m o r e t h a n 2 , 0 0 0 p e o p l e participated and organizers are hopeful they left with a greater appreciation of our water supply and the responsibility we all have to preserve it. Whatever weather Mother Nature decides to serve up this summer, Jen LeClair and Bob Vanhouwelingen and their family are prepared to enjoy it, thanks to their new outdoor living area. The backyard of the Ilderton home that LeClair and her late husband, Todd, built in 2006 was large and lush but offered little shade for the deck and flagstone patio. So, when she and her current partner decided to put their own stamp on the home, a backyard makeover seemed like a perfect project. “We basically decided to bring the cottage here,” she says. LeClair's vision was to create a retreat that included modern comforts but with the ambiance of a cottage getaway. “I love antiquing but I also like to mix up the old and the new,” she says. Left Top: The kitchen area includes a table and chairs that Jen LeClair painted blue, from local Mennonite builders. Left Centre: A comfortable lounge area features a two-sided stone fireplace with a television set inside a recessed nook, enclosed with wooden doors. Below: The pool and hot tub are surrounded by two-toned stamped concrete and wrought-iron fencing. A pool house was created using reclaimed timber. This photo: The outdoor living space stretches 60 feet across the back of the home, bracketed by a double-sided stone fireplace at one end and an in-ground pool at the other. Above: The outdoor kitchen, with a gas barbecue and built-in cabinets, is used frequently throughout the season. Right: Homeowners Jen LeClair and Bob Vanhouwelingen are thrilled with the results of their backyard makeover. • Fresh, local fruits & vegetables • LocaL Meats • In-store Bakery & so much more! stop by today to experIence the brIwood way! 2/5/13 10:14:24 AM Quality Service is Our Specialty! Let EasyPro Vianti Falls kits help make a splash with your next hardscape project! Above: A photo of the home before the patio and pool were added. Brunner says these included opting for a new environmentally friendly saltwater system that decreases salination in the waste water, plus extra protection with four-sided, wrought-iron fencing. The pool also features LED lighting with multiple colours and colour shows. The pool is surrounded by two-toned stamped concrete. “Everyone who worked on it was great and we love the whole thing,” LeClair says of the finished product. Below: A photo of the backyard before the pool was installed. Above: The site plan for Siftonâ&#x20AC;&#x2122;s Timberwalk development in Ilderton. When it comes to creating optimal base surfaces for Garages, Shops or Commercial venues, Dave Brown and James Greenhill have the Floor. They own and operate Garage Shop Floor Solutions, a London company providing coatings for all types of Concrete Floors. Residential demand has been growing steadily due to home improvement television programs along with word-of-mouth referrals. Only proven methods and proven materials are used to produce a long-lasting floor which is impervious to oil, salt, paint spills and almost anything to hit the normal garage or shop floor.And, the floor must look great throughout itâ&#x20AC;&#x2122;s life. Coatings are available in base colours or fleck finishes for a more custom look. Custom Epoxy and Urethane applications at a surprisingly affordable price. Call today for a free estimate! The development will offer a mix of one- and two-storey homes, and buyers will have a choice of brick, stone, stucco or James Hardie fiber cement siding for the exterior of the main level. “The one-storey homes will be a minimum of 1,600 and an average of 1,800 square feet, and the two-storey homes will be a minimum of 2,000 and an average of 2,400 square feet,” says Masschelein. “They will have nine-foot ceilings and most will have a deep foundation with a full walk-out from the basement to the backyard.” While all home builders for the Timberwalk development have not been yet been determined, Sifton New Homes will definitely be involved, along with three to four other local premium builders. Each will offer different pricing and floorplan options, and clients can either select from pre-existing plans or choose to have their new home custom built. Sifton's homes will be Energy Star qualified, and Masschelein expects most others will be, as well. Ilderton is a charming village just minutes from London, with a population of about 2,000 people. Residents can enjoy nature trails, cycling and community parks, one of which has a splash pad for children and, in the winter, snowmobile trails and winter sports. There are also ball diamonds, a skateboard park, a local library, pubs and restaurants, and shops along the main street. Being situated halfway between Lake Erie and Lake Huron, residents can reach the beach in about 40 minutes. The entrance to Timberwalk is right across from the Ilderton Arena and Curling Club. The arena and local fairgrounds host a variety of activities and sporting events year round, including the annual Ilderton Fair, one of the largest country fairs in Southern Ontario. Timberwalk's sales pavilion will open this fall with the grand opening – including an opportunity to tour model homes – scheduled for spring of 2014. Carpet, vinyl, hardwood, laminate, ceramic, LVT, paint, blinds and shutters. Fair Jeanne OntariO’s premier spice experience! Fine spice . Herbs . seasonings Blends . Organic . natural . Gluten-Free. A great selection of unique & flavourful gifts. She Shells Boutique 223 Colborne St. Port Stanley 519-782-7771 Sheshellsboutique@gmail.com PepperTreeSpice_A_JA13.indd <mailto:Sheshellsboutique@gmail. com> Liana’s If she could put theRansom Facebook icon on ad somewhere that would be great! And one of below or whatever she thinks would look great ‘Brand name ladies fashion- something for every age’ Port Stanley’s newest boutique! tours Saturday and Sunday afternoon. The other two ships will offer a combination of cruises and dock tours from Friday morning to Sunday night. The final sailings on Saturday and Sunday evening include dinner at the Wharf Restaurant followed by coffee and dessert on one of the ships where passengers will enjoy live piano music. Evening festivities begin at 7 p.m. Friday night with a free outdoor concert by two-time Juno award winner Jack de Keyzer, opened by Beatles' cover band The Beagles. On Saturday, members of the Royal Scots and the King's Company of Historical Reenactors will skirmish at Little Beach at 11 a.m. and 5 p.m. A variety of activities for landlubbers of all ages will take place throughout the weekend at both the Berm and the Dominion of Canada building. For a complete itinerary, and to purchase dock tour and cruise tickets, visit www.portstanleyharbourfest.com. 6/17/13 A selection of men’s clothes that can easily translate professional to casual, work to play and day to evening! By Ellen Ashton-Haiste Building a new house might have been easier, John Hotchkiss admits. But he feels a connection to the home on John Wise Line, southeast of Aylmer, where he's raised four children over the past few decades and is starting a new family with his wife, Eva, and their infant son. â&#x20AC;&#x153;The house just has a special character,â&#x20AC;? Hotchkiss says. So he and Eva opted for a major renovation that took the better part of a year and completely transformed their one-floor home. As they look at it today, they know the renovation was worth it. And, John adds, it all went seamlessly, thanks to contractor Arne Madsen and his team at London's CCR Building and Remodeling. The project involved recreating many of the rooms, relocating a staircase, rebuilding three bathrooms and creating one new one, turning an unfinished basement into a home gymnasium, and redoing the exterior. Top: The focal point of the kitchen is the 14-foot granite-topped island with a workspace and a raised eating area. Centre: The Hotchkisses chose wall colours, such as the rich red in the dining room, by reproducing the colours of autumn leaves they collected. Madsen calls it “a dream project” for a renovation contractor and one that doesn't come along often in a career. While Hotchkiss says the overall result is “incredible,” he doesn't hesitate when asked his and Eva's favourite aspect of the new space. “Definitely, the kitchen! It's spectacular. You wouldn't believe it's the same space.” Here, three rooms were combined into an open-concept kitchen, dining room and family room. The former '70s-era kitchen, with its small windows and hanging cupboards, is now a wide-open space, anchored by a 14-foot island topped with titanium granite – black based and interlaced with veins of gold and silver. Hotchkiss likes to challenge visitors to “find the bird in the counter.” Looking from just the right angle, there does seem to be an image of a bird in the veins. A couple of kitchen elements are characteristic of the personal and family touches the Hotchkisses brought into the renovation. At one end of the room a mural of a golden, tree-lined, sunlit field is set in an arch, lit from above and framed by dark hickory pantry cabinets. Coming into the room at night and seeing the lighted mural creates a remarkable illusion of looking through a window, Hotchkiss says. Right: Two storage benches form an entrance to the living room from the front foyer. Above: The lower-level workout area includes a steam room clad in slate with Caesarstone bench seating. Top: The master bedroom's ensuite bathroom was enlarged to include an air-hydronic tub, a double vanity and an oversized shower. Quality, Craftsmanship and Trust. Our in house team of professionals allows us to tightly control both the timing and quality of your project. Contact our team and experience the Werks Group difference. Call for stress free exterior solutions. Affordable finance options available. • Highest Quality Products • Highest Workmanship • No Sales Gimmicks • Best Value…PERIOD! INTRODUCING THE ALL�NEW JAGUAR F�TYPE. Every generation has its icons. The ones that sear themselves into our memories so indelibly, they become legend. Now, it’s your turn to experience the legend for your lifetime: the F-TYPE. The triumphant return of the Jaguar two-seater. Available for test drive appointments June 2013 at Jaguar London. THE FUTURE OF SPORTS CARS. vanGogh Chalk Paint Collection WORKSHOPS AVAILABLE " INVENTORY & ADVICE " London Location NOW OPEN, Sparta Studio opening Summer 2013 " ONE-OF-A-KIND painted furniture " Canadian & North American made giftware " "
entrance to the master suite was extended to allow access to this area. The main bathroom was also gutted and redone with hickory cabinets, a Caesarstone counter, double basins and a large shower. As well, the front foyer was raised to create a cathedral ceiling. Here, again, the family heritage is incorporated through wood beams salvaged from the other side of the Hotchkiss family, the maternal family farm dating to the 1860s. Eva says the couple chose the colours for their new space – earthy green and reddish browns – by collecting autumn leaves and reproducing those colours on the walls of their home. Another major renovation transformed the unfinished basement. This level's low ceilings were raised and plumbing vents and ductwork were re-routed to create a workout room. There is more family history here. The walls are lined with hockey jerseys in framed display cases, a nod to Hotchkiss's late father, Harley, former owner of the Calgary Flames. The workout area also includes a new bathroom and steam room clad in slate with Caesarstone bench seating. Rerouting the utilities created a crawl space and concrete flooring was installed through part of this area for additional storage. CCR also updated the exterior of the house. A front gabled porch was created with riverstone to offset the oversized front door. “When I saw that, I knew that the rest of the brick had to go,” Hotchkiss says. It has been redone with a three-foot base of stone veneer, topped with James Hardie fiber cement siding. The transformation has been beyond the couple's expectations, Hotchkiss says, adding that it takes teamwork and expertise to effect such a change. He particularly commends CCR site supervisor Larry Fenwick – “we came to think of him as family and were sorry to see him go” – as well as designer Myra Tuer. “She was invaluable,” Hotchkiss notes. OUTDOOR, WICKER, MODERN The CoasTal collection is simply beautiful with gentle curves formed out of skillfully woven all weather wicker. This collection is smaller scale making it an excellent choice for many applications. The Coastal collection is available in Driftwood and Roasted Pecan finishes. Our BeaCh house collection combines clean lines and the comfort of all weather wicker to provide the ultimate in contemporary deep seating. The Saddle weave adds richness to a timeless design. souThaMpTon a world of simple abundance with nature and sophistication in friendly competition. Comfort understated in a durable hand-woven synthetic material over an aluminum frame transitions any environment into the world of privilege. The Del Mar collection exudes classic contemporary style. The collection’s gently flared arms and the curve of the back which extends through the leg, create an inviting silhouette that promises comfort. 6/15/13 Washing & Repairing Oriental Rugs for over 30 Years! Treat your skin with Love. Organic makeup and skin care for acne, sensitive skin, rosacea, eczema, psoriasis. using (other) so-called permanent fillers which I do not suggest.” Hyaluronic facial fillers are also beneficial when used as an adjunct to surgery and can be used to add volume to bony areas such as cheekbones, which typically flatten and fall with age. In addition, hyaluronic facial fillers can help correct contour changes due to the underlying loss of facial skin volume following surgery. Aside from surgery and facial injectables, some devices promise nonsurgical face lifts. “In my experience, devices that use the principle of heat creation to perform non-surgical face lifting will not produce the results of surgery,” Colcleugh says. “The application of heat to facial skin results in some delayed scarring under the skin and affects some tissue tightening. However, the amount of tightness produced is limited in my opinion with … results that are less than most patients are seeking,” Colcleugh adds. Many people as young as age 30 detect skin changes, which accelerate with time. Colcleugh says depletion of estrogen is a major factor in the changes. Skin thickness also diminishes with time and menopause. Resurfacing and pigment laser treatments are among the non-surgical treatments that Colcleugh believes can offer real advantages in managing aging facial skin, which thins and develops blotchy-looking skin pigmentation with enlarged blood vessels, dark spots and a greater likelihood of benign and cancerous lesions. “Resurfacing lasers are somewhat invasive and involve varying degrees of healing and downtime but can be advantageous, resulting in significant skin texture improvement, with some superficial tightness that lasts months to years in some patients,” Colcleugh says. Pigment lasers are a less invasive type of laser which can remove or reduce facial spots and small facial veins with minimal downtime. Alzheimer’s Special Care Center The decision to admit a loved one to a care facility is one of the most difficult a family must make. Choosing Arbor Trace will ease your mind. Arbor Trace Alzheimer’s Special Care Center is a community designed to accommodate individuals with Alzheimer’s Disease and other related dementias. Our “Meaningful Moments” program honours the individual life of each resident, while addressing their unique needs through the aging experience. Aroundthe-clock care and attention is provided on an individual basis by our caring, professionally trained staff. Arbor Trace, your local dementia care experts, is here to take the difficulty out of caring for your loved one with dementia. ASK ABOUT OUR MOVE IN SPECIAL Call us to put your mind at ease. Old-world craftsmanship takes a modern twist in the powerful hands of blacksmith Scott McKay. From sculpture to finely fitted metal cabinetry he does it all, and with flair and aplomb. A full-time artist since January 2010, McKay's journey has been anything but straight and narrow. After graduating from Wilfrid Laurier University in 1995 with a Bachelor of Arts degree in geography and biology, he certified as an industrial mechanic (millwright) and worked with some of Canada's leading diamond mining operations before attending the Haliburton School of The Arts and emerging with an Artist Blacksmith Certificate in 2006. It is perhaps the confluence of these different streams of education and experience that allows McKay to do the work he does. His workshop, aptly named Strong Arm Forge and promoted with the mantra “One Man, Many Hammers,” is located north of Shedden, about 15 minutes west of London. There, the artist works with recycled materials recovered from salvage yards and roadsides, as well as new materials such as mild or stainless steel. “Farm Sentinel,” a 78-inch-tall bird sculpture that is permanently perched at a country retreat south of Ottawa is made from recycled metal. The sources of many of its parts – the sawmill blades, the drill bits and the cultivator teeth – are evident. PAINTED FURNITURE BOUTIQUE On the other hand, the abstract sculp249 Talbot Street, St. Thomas, ON ture “Near Miss” is constructed of all(519) 207-8623 new stainless and mild steel. It draws on Workshops McKay's diamond mine experience. Custom Work “There,” explains Consults McKay, “safety was Chalk Paint decorative by Annie of the utmostUsing importance. When anpaint acciSloan (add registered logo after chalk paint) dent almost happened, but was preventin as fabulous French furniture! ed, we wouldSpecializing refer to it a 'near miss. '” The sculpture's elements represent the www.diamondsntoads.com event, the investigation and the person who escaped from the near miss unscathed. Many of McKay's pieces are intended for outdoor display, and creating outdoor sculpture has its own challenges. A recent commission required McKay to design an outdoor piece based on a photograph of a sari, a strip of unstitched cloth – ranging from four to nine yards in length – worn by Indian women. In this case, it was the Brampton customer's wedding sari. The artist made use of AutoCAD as part of his design process and the pieces were cut by laser, demonstrating his willingness to embrace new methodology. “The integration of traditional forging techniques with contemporary fabrication technologies is necessary and allows for limitless possibilities,” McKay says. The result was eight Corten steel panels, each standing 88 inches tall. Have a Chair Affair! Our Complimentary In-Home Design Team can create that “forever” dream home for you to enjoy for years to come. Your Designs…Delivered More than 120 colours on display. More than 60 colours in stock. Corten steel, also known as weathering steel, contains alloys that cause it to form a stable rust-like patina when exposed to the weather for several years. This eliminates the need for painting, which pleases McKay to no end. Although he makes occasional use of colour in his work, he prefers to leave it raw and unpainted. Of late, McKay's emphasis has been on “living space structures” that are useful as well as beautiful. He recently completed two such pieces, a workbench and a bar, for a customer's custom garage. This was precise work with tight tolerances and McKay relied heavily on his millworking skills. Tight tolerance, however, did not temper McKay's creativity. The finished pieces which combine stainless steel, checker plate and copper plate are rugged and aesthetically pleasing. The apparent dichotomy between his fine and his functional art suits McKay just fine, as does the fact that much of his work – the collaboration with the customer, the design and the planning – relies on brain rather than brawn. “I need that balance in my life,” he says. McKay draws influence from his surroundings and from life. As a result of living near Lake Erie, his sculptures have fluidity akin to waves on water or wind across a field. The challenge when working with metal, says McKay, is to “remove the heaviness so people think it's moving.” Life as a full-time artist has been good to him. “I don't have a lot of finished pieces lying around,” McKay says. “They are going as fast as I can produce them.” He relies almost exclusively on wordof-mouth advertising to grow his customer base. Facebook has been a big part of this and he often receives referrals from other metal workers. McKay, along with 11 other artists, will be displaying his works at the “Art of Birds” exhibition August 6-17 at The Art Exchange gallery in Wortley Village. LIFESTYLE r e s o u r c e s Address and website information for the companies and/or retailers featured in the articles in this issue are listed by order of story below. Specializing in kitchens, bathrooms, large additions and Victorian restorations. Thank You London for voting us Londonâ&#x20AC;&#x2122;s #1 Kitchen Renovator! We proudly offer a lifetime warranty on cabinetry.